All luxury desert enthusiasts planning to create unforgettable memories on Valentine’s Day this year, are welcome to choose their favorite lavish Bab Al Shams Valentine’s Day experience at the award-winning Desert Resort & Spa. 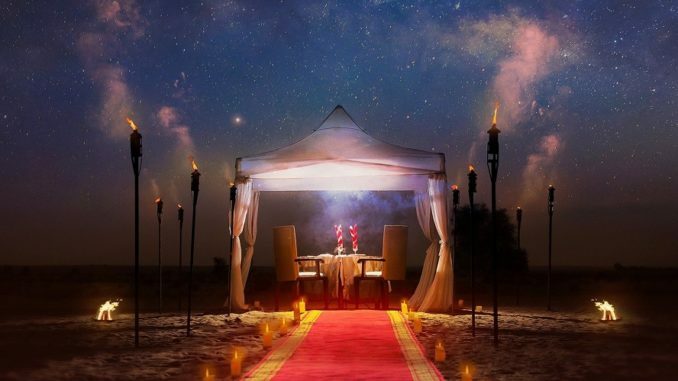 On Thursday, 14 February 2019, Romantic Dinner at Sunset Point offers an exclusive experience under the stars of Dubai, while Italian restaurant Le Dune presents a special Valentine’s Candlelit Dinner. To extend the celebration of this occasion, an exclusive Valentine’s Garden Brunch awaits guests on Friday, 15 February 2019 at Al Forsan restaurant. 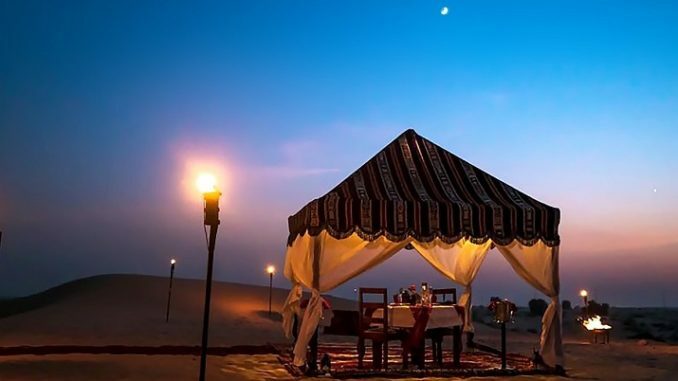 Couples looking for a personalized and romantic experience are invited to celebrate Bab Al Shams Valentine’s Day with a unique culinary experience at their private decorated tent at Sunset Point area, surrounded by bonfire and relaxation Majlis under the stars of Dubai. Every couple will experience an extravagant four-course menu, carefully prepared by the resort’s professional culinary team headed by executive chef Clive Micallef, together with a bottle of sparkling rose grapes beverage, presented by a dedicated butler, while enjoying the live tunes of the violinist to mark this year’s celebration with an authentic Arabian hospitality and outstanding views of the Dubai desert and sky. With an elegant fusion of Italian and Arabic inspired décor and Al fresco terrace overlooking the Palm courtyard, Le Dune restaurant is the ultimate destination for all couples to celebrate their love journey in a unique atmosphere with the exclusive Valentine’s Candlelit Dinner. 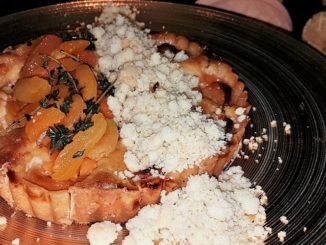 Every couple will enjoy four-course Italian menu, prepared by the culinary team especially for this occasion together with soft beverages or a bottle of sparkling grapes beverage, while listening to romantic background music. 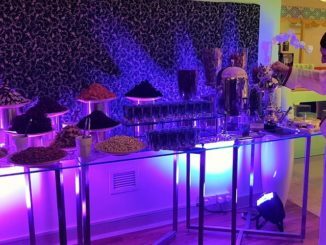 For one day only, Friday, 15 February 2019, The Garden Brunch will transform into Valentine’s Garden Brunch offering a special Valentine themed brunch, whether with its culinary delicacies or with its Valentine decorations. 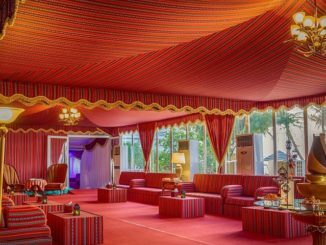 Couples and families are invited to enjoy this one-day-only brunch, from its extensive buffet, spread at the garden area and inside Al Forsan restaurant, its live-cooking stations offering cuisines from the different part of the globe or with the live tunes of the four-piece band and the kids’ dedicated entertainment corner that includes pony and camel rides. Located 45-minute drive from the city of Dubai and from Dubai International Airport, the 5-star desert luxury ‘Bab Al Shams Resort & Spa’, suited in the heart of Dubai desert, is the perfect destination for families, couples or simply desert lovers. Overlooking the natural desert, this award-winning resort offers 115 rooms and suites range from 47 m² to 68.4 m² with authentic Arabic design and modern touches. A wide selection of restaurant and lounges complete the guest dining experience throughout the stay, from ‘Al Hadheerah Desert’ restaurant with live entertainment, Indian restaurant ’Masala’, traditional Italian cuisine at ‘Le Dune’, an all-day dining international restaurant ‘Al Forsan to ‘Al Sarab’ Rooftop Lounge, ‘Ya Hala’ Lobby Lounge together with ‘Al Shurouq’ Rooftop Terrace and the Pool Bar. An extensive leisure and outdoor activities await the guests including two outdoor temperature-controlled swimming pools, open 4×4 desert drive, desert fat biking, archery, camel riding, falconry together with various sports games, from volleyball and croquet to table tennis and boules. With 4 treatment rooms and an indoor and outdoor relaxation areas, the award-winning ‘satori’ spa offers an urban oasis for spa goers to indulge and re-energize. Children between the age of 5 years – 12 years, will be entertained with fun activities with three different programs in the indoor “Aladdin’s Kids Club’. Bab Al Shams Desert Resort & Spa is a member of the Global Hotel Alliance and its Discovery loyalty program.